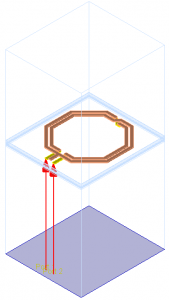 Dr. Mühlhaus Consulting & Software GmbH » Inductor EM simulation: 1-port or 2-port? 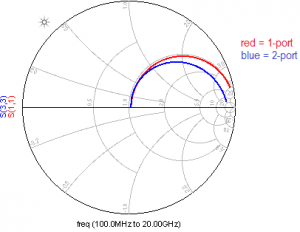 Home » Support » Keysight ADS Application Notes » Inductor EM simulation: 1-port or 2-port? 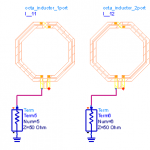 How to simulate RFIC inductors in Momentum, as 1-port or 2-port EM models? Why do we get different results for the Q factor, and which is right? 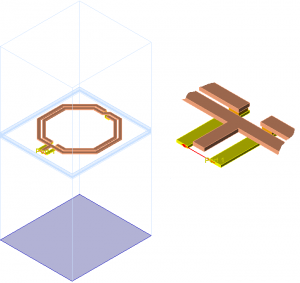 When EM simulating on-chip inductors, it is not obvious which port configuration is “best”. 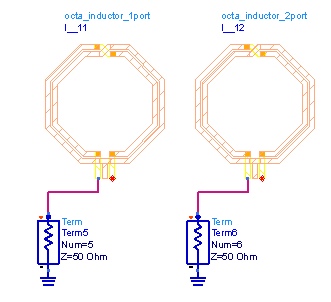 Depending on the port configuration, the extracted inductor properties can be very different. In this document, we will review the different configurations, and find out what is most suited for parameter extraction and modelling. Both configurations are valid from an EM simulation viewpoint, but the differential 1-port configuration only provides valid results for purely differential excitation. 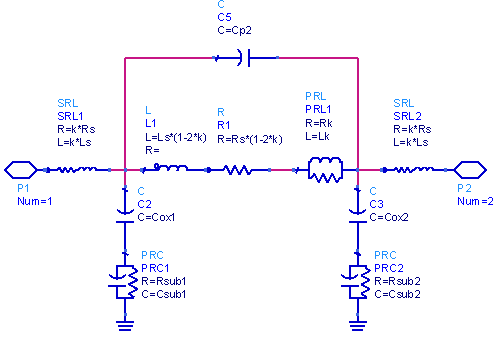 Connected in a circuit with single ended or mixed excitation, results are not valid. Usually, the 2-port configuration is what you want for modelling, to have correct results for all possible excitations. This is discussed below. 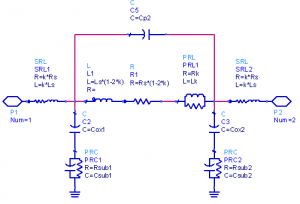 Differential operation is the typical use case in oscillator tank circuits and other circuits. 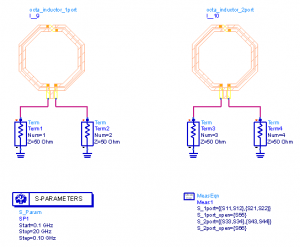 We can always connect the full 2-port EM data in differential configuration at schematic level, to see how it performs with differential signal. For purely differential use in the circuit, this provides the same results as 1-port EM simulations, but it will also provide correct common mode or mixed mode data when needed. So we get identical results from 1-port and 2-port EM data when connecting them purely differentially at schematic level. The inductance and Q factor for this differential mode (“Differential L and Q”) is what many circuit designers are interested in. Note that differential Q factor and self resonance are different from results in single ended configuration, so we need to document what data is shown, differential or single ended. Besides getting correct results for all possible excitations (e.g. differential circuit with some residual common mode signal), another advantage of EM-simulating the full 2-port EM data is that it can be used to extract the inductor’s equivalent circuit model. This is not possible with 1-port data, because series and shunt path elements can’t be separated from 1-port data. This is only possible with the full 2-port data. There is nothing wrong with ADS or Momentum. 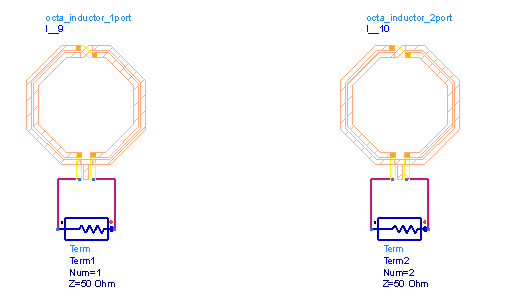 These differences are caused by the user, who has connected the ports differently in EM and circuit level simulation. In the 2-port EM results, we have valid data for all possible combinations of pin/port1 and pin/port2 to ground. This includes differential connection between the pins, as well as “single ended” connection from each pin to ground. In the 1-port EM results, we have less data. 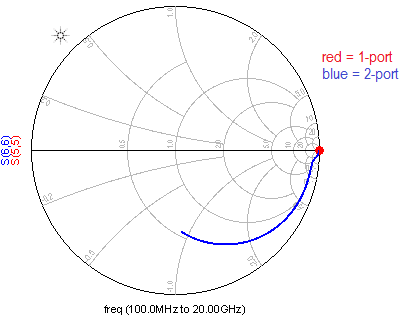 S-Parameters for 1-port correspond to an impedance between the (+) and (-) node. For the inductor, the 1-port simulation provides an effective value that is the parallel connection of series path and cascaded shunt paths. This results in one impedance, which is valid for this exact port configuration. Once reduced to 1-port data = one impedance value, we can never again separate shunt path and series path from that data. 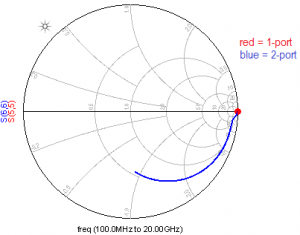 Even if we re-wire the symbol for the 1-port data, it remains a single impedance value. For the inductor, this means that a 1-port EM block re-wired into series connection has only that series path (impedance as calculated for the EM port configuration), but no shunt path to ground. That separate data just doesn’t exist, and can’t be extracted from 1-port EM data. Does it matter? Yes! 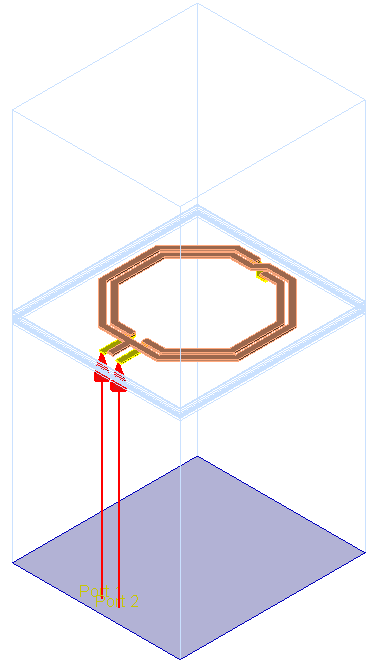 This can be shown by simulating the inductor with one side floating. This breaks the series path, but proper real-world results should still show the effect of shunt path current flowing to the substrate. 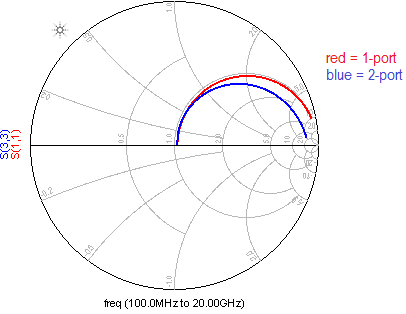 Indeed, this shunt path is seen in the 2-port simulation results (blue curve). 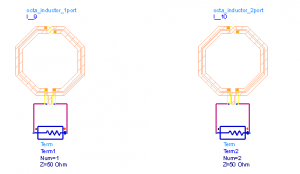 However, for the 1-port EM data block, we see an ideal open circuit. No surprise, because there is no separate shunt path data available. The 2-port EM does have valid shunt path data flowing to the grounded reference node. The 1-port EM data provides just an effective impedance between the (+) and (-) pins, and that is floating on one side. The re-wired 1-port is a pure series element, with no shunt path, so it provides an open circuit (red circle) when connected this way. We can conclude that the 2-port data is more flexible, because it works in all series and shunt configurations. The 1-port data with differential port configuration is only valid for that differential configuration. 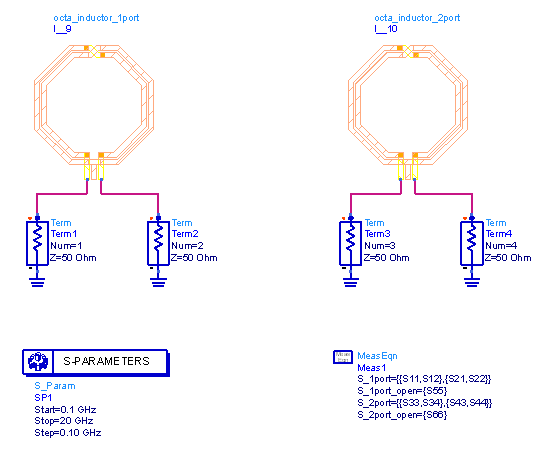 If the separate pins in the schematic symbol are “abused” to wire other configurations, results will be wrong.